Ford is more than doubling its investment in electric vehicles, reviving the Mach nameplate made famous by early Mustangs on a high-performance electric SUV due in 2020. 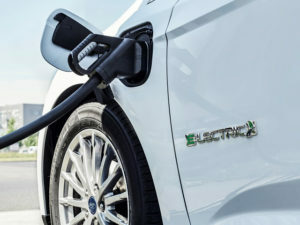 Speaking at the Detroit motor show, executive vice president and president, global markets, said the company would invest £7.98bn ($11bn) in “electrifying the best of Ford” – offering the freedom and road-trip spirit of the brand, including high-performance models, but via battery-powered drivetrains. The carmaker has been relatively slow so far, with a low-volume electric Focus available in selected markets, plug-in hybrids for North America, and a hybrid Mondeo available in Europe. Next year, it will launch its first plug-in hybrid in Europe – a variant of the Transit Custom – and a longer-range electric version of the next Focus, due to be revealed this year, is also likely. In 2020, the line-up will grow to include a fully-electric SUV called the Mach 1, built in Dearborn, Michigan and sold globally, which will offer a range of 300 miles when fully charged. Ford’s participation in the Europe-wide Ionity ultra-fast charging network suggests this could offer 350kW charging capability – replenishing most of that range within half an hour. Hybrid versions of the Mustang and F-150 pickup, as well as electrified police vehicles, will also be available before the end of the decade.